Guanacaste Nicoya Region, ca. 1 to 500 AD. A good example of a white stone mace head with the stone now mottled from deposits. 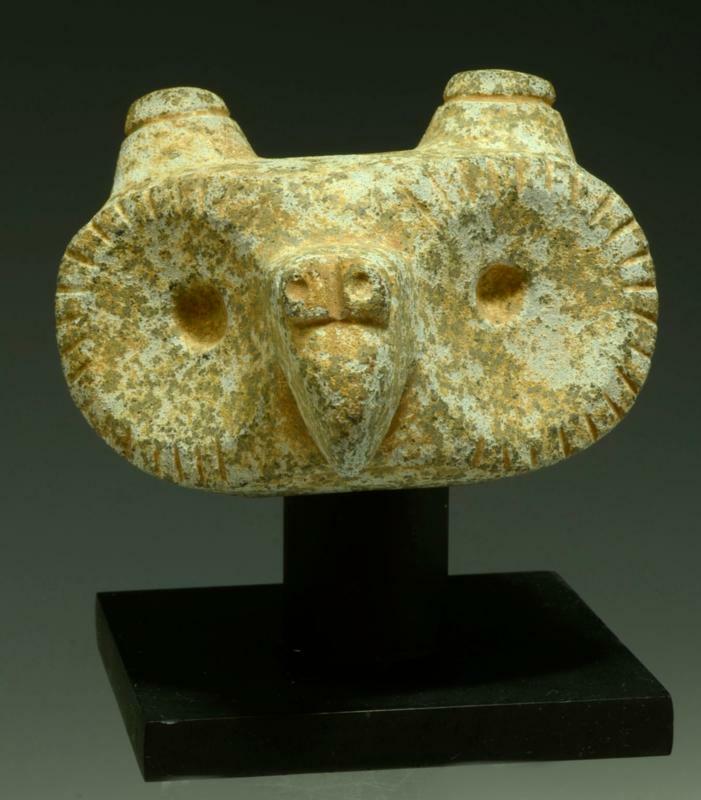 One side is carved into a fierce owl face with huge, round eyes and a long, pointed beak. A cylindrical socket is behind the head. The owl is frequently associated in Central American iconography with the underworld, death, and shamanism. Size: 3.45" W x 2.4" H (8.8 cm x 6.1 cm); 3.95" H (10 cm) on included custom stand. Provenance: ex-private T.S. collection, San Diego County, California, USA, acquired between 25 and 40 years ago; Ex Orlando FL Dentist Collection.